Recently I mentioned that I was very excited that M was able to go to her super-fun track meet at Dartmouth in spite of her early-season injury. Well, we had low expectations because she’s still just getting back into shape, but the meet went great for her. She ran in two races (this is fairly typical), the 1000 meter and a 4 x 800 meter relay. For the 1000 meter she got close to her PR (I say things like “PR” now because I’m a track parent and the track kids always talking about personal records, you know) and placed 5th out of 90 runners. So not bad, especially for someone who was literally limping as she walked just one month before! Even better, she and her three lovely friends won their relay race. M’s portion wasn’t a particularly great time for her, but she moved them ahead in the race, so she helped, and they won by a pretty wide margin. And the girls’ team overall won the whole meet for the first time ever, so: whoop, whoop! That is all very excellent, but M is currently at what she describes as “Stress Level Midnight” because they’re finishing up the second marking period and she has all sorts of exams and assignments, plus track and soccer practices to keep up with. Lucky for her, she’ll have exactly zero school next week because of Regents exams. J, meanwhile, had her first ski club on Friday and managed to keep all of her digits in spite of the oh-so-frigid temperatures. She’s also been going to yoga, sometimes on her own at Power Yoga New York and sometimes with a friend at the JCC, And of course she’s got volleyball practices as her Northeast Thunder team gets ready for their first tournament at the end of the month. She is officially libero for the team, which is the position that she loved playing for NET last year and which will be a change from school ball, where she was a hitter. But she says that they all get to practice everything, anyway. The kittens are crazy. It’s funny because of course Isis refused to be caged in, so I was a little bit worried about Ruth and Dave getting bored just inside our house, but they are still so little and so fascinated by everything that really, going outside would just make their universe way too huge. They went crazy for the Christmas tree, running madly in circles around the trunk and pouncing on every suspicious fold of the tree skirt. Now that that’s no longer available for entertainment, they’ve discovered a low table that I recently moved into our dining room. Come to think of it, it may have been a mistake. I had three plants that were pretty much fading out for the winter, and I decided that the sensible thing to do would to be to set them in one of our sunniest windows. 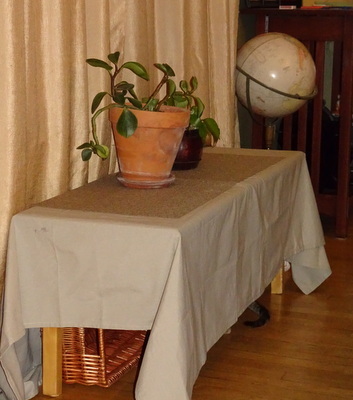 With a tablecloth, maybe it would be another place to shove backpacks and school books so I wouldn’t have to see them everywhere, and, oh, by the way, maybe the kittens would enjoy a table at that spot, too. The answer is that the kittens LOVE that spot, but it is not just for the sunshine, but for the joy of jumping on, off, and under the little table and, most of all, for the opportunity to snack on and generally abuse the plants. Nope, they’re not poisonous, I already checked. 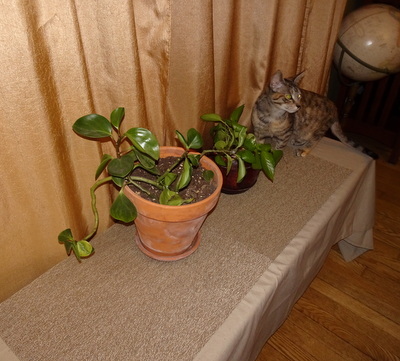 In fact, I’d already rid our house of three different schefflera plants for that very reason (which is sad, because those plants are exceptionally hard to kill, making them just my speed). Any delusions I had that this would offer up an improvement to our clutter solution have been cast aside–the basket I’d put under the table is a new favorite resting place, but often only after they’ve pulled out the liner and/or flipped the basket over and pushed it around the room. And if my initial intention had been a move for the plants’ welfare, then I’ve failed miserably. And yet I’m such a smitten kitten mama that I am not dismantling the new set-up (except for one plant that’s been moved based on the tippiness of its basket) nor am I attempting to make the cats stop their abuses. Instead, I just gaze at them beatifically without intervening as they shred leaves, kind of like that mother at the playground who would say, “Oh, isn’t it adorable how he’s waving that stick around like a sword?” while you silently hated her.